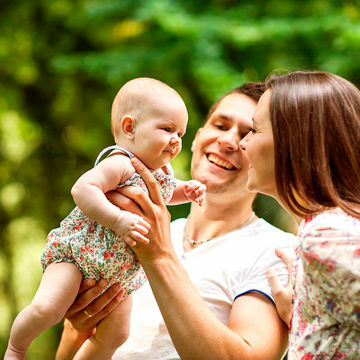 Should You Use Baby Talk with Your Little One? A new study finds that moms communicate with their baby using high-pitched, exaggerated cooing sounds, while dads talk to them with adult tones. So which is better? Chances are, from the second you hold your baby in your arms you'll be speaking to him or her with high-pitched, exaggerated cooing sounds. "Who's a cutie pie? You are! Yesss, yooou are!" you'll probably be saying. But a new study from Washington State University presented Tuesday at the Acoustical Society of America's annual meeting shows that it's really only mothers who do this—dads mainly talk to their kids with regular, adult tones. The kind of baby talk that moms use is called, fittingly, "motherese," or "child-directed speech," which has long been thought to foster mother-baby bonding. But because fathers are becoming increasingly involved in their children's lives, the researchers wanted to explore whether dads use motherese as well. So they had parents and their preschool-aged children wear recording devices and monitored their interactions over the course of a normal day. The results confirmed previous research on moms, showing that they use high pitches and vary their pitch when talking to their young ones. But the study, the first of its kind to examine dads' speech, found that fathers don't change their vocal patterns as much—they speak to their kids as little adults. So which type of speech is better for babies' language development? "Motherese is possibly used to gain the attention and interest of the baby," Dr. Mark VanDam, the study's lead author and director of WSU's Speech and Language lab, tells FitPregnancy.com. Its exaggerated speech patterns, which are similar to babies' own babble, are easier for them to recognize and, eventually, imitate. But that doesn't mean dads are losing out by not using baby talk. "There is no evidence that less motherese puts dads at a disadvantage," VanDam says. By using adult tones, dads actually become the babies' "bridge" to the language they hear in the outside world. Dr. Nancy Potter, CCC-SLP, a colleague of VanDam at WSU, tells FitPregnancy.com that fundamental differences in parenting styles may be at the root of why men and women talk differently to children. "Fathers often tend to be 'end-goal oriented' and mothers are often more 'process-oriented' in their approach to raising children," she says. "When I was a young mother, reading a book could take most of the morning as we imagined what else might be transpiring on the pages." Previous research has suggested that dads have a bigger role than mothers in language building (which could be a boon for kids of stay-at-home dads). "Fathers who talk with their children certainly enhance their child's vocabulary acquisition," Potter says. "Dr. VanDam's 25-month-old recently asked me if I would like to see her 'swoop like an eagle, or slink like a saber-toothed tiger.'" But that doesn't mean that moms should stop using baby talk. VanDam stresses that both parental methods of speech have their own advantages for children's development. "Mothers may give children the opportunity to use familiar speech, and fathers give children the opportunity to use 'public' speech," he says. "In this way, mothers and fathers are complementary in giving children the chance to practice both. In general, parents should do what comes naturally." So go ahead and coo away, moms—you probably couldn't help it if you tried anyway!